George Bush began his presidency in 2001 and a few months after he took charge, September 11 happened. 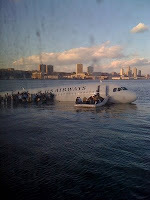 Now a few days before he leaves office, US Airways flight 1549 happens. While it is unlikely that he had anything to do with the miracle of flight 1549 and also for what had happened for September 11, it puts into perspective the notion that a person with great power on his hands may not have everything running the way he may want it to be. Is that an apology for his presidency? Nope. He is already defending his legacy before leaving office. I think he knows that he may have messed up quite a bit. The new president of USA steps into office tomorrow on the 20th of January. It marks a new beginning and a hope that things will be better. If President to be Obama is as skillful a president and leader of men and nations as Chesley B. "Sully" Sullenberger is as a pilot (the captain of flight 1549 in case you live on Mars), we will see a new entry to the four famous faces on Mount Rushmore. In case you have any doubts about the huge task that Obama faces, you can read the four challenges facing Obama just in 2009 on CNN. Obama's cabinet lineup has a nice mix of what america is all about, Whites, African-Americans, Asian-Americans, Hispanics. I wish him calmness in face of adversity, fairness in weighing his decisions, thoughtfulness in thinking through his policies and greatness at the end of his term in office.